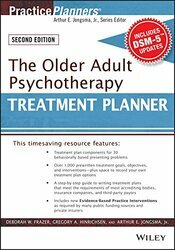 The Older Adult Psychotherapy Treatment Planner, Second Edition provides all the elements necessary to quickly and easily develop formal treatment plans that satisfy the demands of HMOs, managed care companies, third-party payors, and state and federal agencies. As a leading expert in the field of aging, Dr. Hinrichsen was previously the chair of the American Psychological Association (APA) Committee on Aging, president of the APA Society of Clinical Geropsychology, APA Congressional Fellow in the U.S. Senate, and chair of the Council of Professional Geropsychology Training Programs. He is the 2015 recipient of APA’s M. Powell Lawton Award for Distinguished Contributions to Clinical Geropsychology. Dr. Hinrichsen co-authored the books, Older Adult Psychology Treatment Planner (2011) and Interpersonal Psychotherapy for Depressed Older Adults (2006). He has written numerous publications and trained social work and psychology students and professionals in how to effectively work with older adults. Greg is on the faculty of the Department of Geriatrics and Palliative Medicine, Icahn School of Medicine at Mount Sinai in New York City. ARTHUR E. JONGSMA, JR., PH.D., is the Series Editor for the bestselling PracticePlanners®. Since 1971, he has provided professional mental health services to both inpatient and outpatient clients. He was the founder and director of Psychological Consultants, a group private practice in Grand Rapids, Michigan, for 25 years. He is the author or coauthor of over 50 books on treatment planning and has conducted training workshops for mental health professionals around the world. DEBORAH W. FRAZER, PH.D., is a licensed clinical psychologist who has worked with older adults for more than thirty years as a clinician, teacher, administrator, and consultant. Dr. Frazer is the author of more than thirty articles and book chapters related to work with older adults. She has written, taught, and developed programs in public, nonprofit, and corporate settings, and is currently an independent practitioner and consultant.